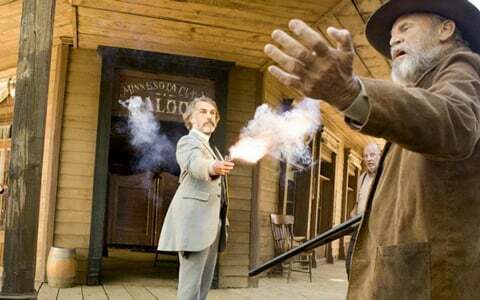 Confidently talking his way out of sticky situations, fluidly switching languages and wielding a gun with terrifying precision, Christoph Waltz seems to be right back in his comfort zone in Django Unchained, reunited with Quentin Tarantino four years after he won the Oscar for playing Hans Landa in Inglourious Basterds. But though Waltz admits it was a "smooth and light and easy and fabulous" process of signing on to the film, he warns that being too comfortable on his second Tarantino picture was exactly the wrong way to approach a character as complicated as Dr. King Schultz. A German bounty hunter who loathes slavery but who's willing to use the system to his advantage, Dr. Schultz buys Django (Jamie Foxx) and frees him, using the former slave's knowledge to help hunt down three men he's been assigned to kill. Their partnership gets more complicated, though, when Schultz decides on a romantic impulse to help Django free his wife Broomhilda (Kerry Washington) from the Candieland plantation. Just like in Inglourious Basterds, Waltz is tasked with immense pages of dialogue and scenes that change tone on a dime; speaking to him on the phone earlier this week, I asked how he approaches a script like this, what he learned about the West while riding a horse through it, and why the director's cut of Django Unchained probably won't be in theaters any time soon. Django Unchained-- the current version, at least-- comes to theaters December 25. It seems pretty clear that Quentin wrote this role for you. Is that true? I think I can safely say he did. Even though his way of telling me was just extraordinarily wonderful, because he put these pages in front of me and communicated this through the character. I got to see the script as he was writing it. In a way it was a hint. In a way it was his way of saying of get it. I think without trying to be presumptuous, I did get it. That was about a year ago. Had you guys had conversations about working together again after Basterds? I never do that, because I don't want to put pressure on anybody. If these people I work with are trustworthy, and I feel safe with them, I always say, look, if there is something for me in one of his movies, he will call me. If he doesn't call me there's nothing in it for me. It's kind of a clear thing. So how did he talk you into taking the part? That's why he invited me up to this house and showed me the pages. There was never a question. It was all very smooth and light and easy and fabulous. When Quentin Tarantino hands you these giant dialogue scenes, are you preparing for them the way you would a play? How do you deal with just so much talking? The parallel or the analogy to theater is not wrong. It really, really helps to have done theater, and I have done theater extensively, to the degree where I got sick of it. That experience is in valuable for doing Quentin's dialogue and scenes. I just wish we could once play a whole Quentin movie as play in one. To really start on the first line on the first page and play it all the way through. The mere technical aspect of moviemaking requires you do it in smaller portions. Quentin sometimes goes very long takes, even thought he doesn't need it all from that angle. If you have a lot to say, you have to say it over and over and over again. If you have a monologue of three pages, you might end up doing it 20 or 30 times in a day. It really is an actor's work. With something like that long, long dinner table scene in Candieland, how many takes does it take to get into the rhythm in it? How long do you spend sitting at that table? You get into the rhythm hopefully the first time around. You improve-- it's not the amount of takes of one setup, it's the many setups that finally make one whole scene that make it repetitive. That's what we do for a living.That's the only difference between the professional actor and everybody else. We all do roleplaying all the time, and if you only do it once, everybody can do it. So if you have to do it 30 times, hone it, chip away, make it shorter, longer, there's craft involved. That scene has a lot of shifting tones. Are you doing it differently from take to take to see how the mood changes as the scene plays out? Having played Hans Landa and worked with Tarantino before, did you go into this film with some added confidence, or was it completely different? Completely different, and that's why I didn't want to be overconfident or take anything for granted. Every story wants to live in its own right. Like your kids, you can't say "my kids." Each of them is different from the other, and you have to treat them accordingly, and you have to pay different attention to different things. What made Django Unchained so different? The story. The whole setup is different, the connotations are different, the characters are different, my character is completely different. If I would apply what I needed in Basterds, I would be barking up the wrong tree. It's important to find the right tree to bark up on. I really tried to make the story or the script, rather, the very source of everything I do. People ask, have you modeled this after someone? Come on, I'm not a impersonator. I'm just an actor. I have this script, I'm not messing about with the character that a writer comes up with. Especially if it's a writer like Quentin Tarantino. There's so much. All you can really do is try not to miss the point. Your character is an outsider to the world of American slavery, and I assume you were as well, Did you have to dig in and learn how it worked, just like Schultz did? Of course I did. I can claim that I went to a good school so we had history and we learned about that. American secession and the history and the South and the North. The finer points, of course I didn't know. Yet Quentin's point of view what was required. Of course you need to know the historical details, but it's almost more important to put them in the context that makes up they story. You need the historical fact as a groundwork. So what was that context for Quentin's story-- the films he's using as reference? I grew up at the time of spaghetti Westerns, and I grew up much closer to spaghetti Westerns than anyone else here. Not to the Western, but to the spaghetti, because I grew up in Austria, and I grew up in the 60s. That was the big time of the spaghetti Westerns. I was familiar with most titles, even though I might not have seen all of them. I saw quite a few. I was familiar with that genre, but I was not familiar with the impact it had, the repercussion, of how it is perceived in the homeland of the Western, because that's a completely different angle. I saw it as an Italian version of something exotic. Were you learning about American Westerns by shooting in all these far-flung locations? We shot in the Alabama Hills, which was traditional Western country-- film Western country. They've shot Westerns up there since the silent movie era. We were in One Pine, there is a movie museum, and they cleared a corner for Django now. Is there anything in particular that was cut from the film that you're eager to see in a longer director's cut? There are little bits and pieces that I thought would make for good additions, but the movie is long enough as it is, and I think we had almost two hours more. It's impossible, and Quentin chose this one for me, he want to finish that one story, and then you can't overburden people. A Wagner opera, I think the Twilight of the Gods is about 5 hours and a bit, but you get two or three intermissions so you can go outside, so you can dedicate the day to watching that. Movies are different experiences. Exhibitors wants to show them as often as they can per day, and also nobody wants to take that time. It would be great to have a big epic, four hours long with two intermissions. You can only show it once a day.